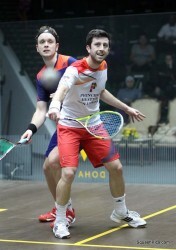 It was a case of 13th time lucky for Daryl Selby today in the Qatari capital Doha where the world No 11 toppled England team-mate James Willstrop in the second round of the Qatar Classic to claim his first ever win over the world No 3. 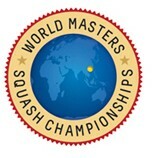 The upset, which takes Selby into the quarter-finals of the seventh PSA World Series squash event of the year at theKhalifa International Tennis & Squash Complex, follows 12 successive Tour defeats by former world No 1 Willstrop since January 2007 – and further losses harking back to the final of the British Junior U-12 Championship in October 1994 when Selby mustered just two points! “It’s an amazing win for me,” exclaimed the 31-year-old from Essex after his 11-8, 11-5, 4-11, 9-11, 13-11 over the event’s second seed in 89 minutes. 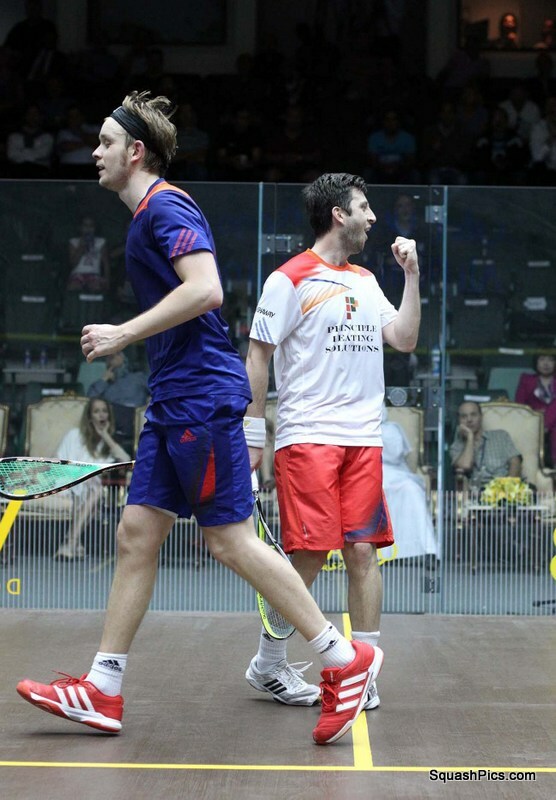 “I’ve lost 12 times on PSA against James and about 100 times in other competitions – so I’m ecstatic to win. “I’ve come close before and thought I’ve done it, so it’s a massive weight off my shoulders. 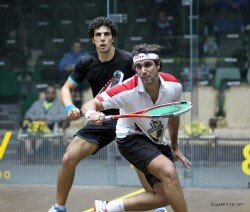 “It’s a big confidence-boost, especially coming off making the quarters of the worlds last week. I want to keep going with the momentum and see where it takes me. Tomorrow will be another tough day but I’ll re-group and go forward. 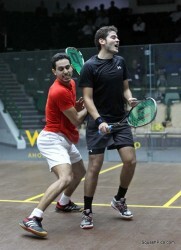 Selby clinched match-ball with an incredible winner hit from behind his back! Unseeded Selby will now face fifth seed Mohamed Elshorbagy for a place in the semi-finals after the world No 6 from Egypt beat Dutchman Laurens Jan Anjema, ranked 12 places lower, 11-7, 11-6, 11-8. 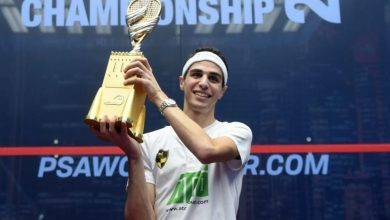 “I like playing on this court but I can’t get over confident and I have to make sure that I focus on what I have to do on court,” said the 22-year-old from Alexandria, who was a surprise finalist in last year’s PSA World Championship at the same venue. “I was really happy that I kept my plan going and I was really happy to finish in three today – as, after a five-game match yesterday, I knew I needed to have a quick game to be in with a chance of going all through the week. 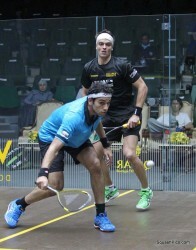 There was another significant upset earlier in the day when unseeded Egyptian Karim Abdel Gawad pulled off a shock 11-9, 5-11, 11-9, 9-11, 12-10 victory over eighth-seeded compatriot Tarek Momen. “I’m very pleased with my performance,” said the world No 22 after his 82-minute win, his first over former world No 10 Momen. “I was expecting a very tough match – we have played many times in practice over the years and he is a top 10 player in the world so to win is very pleasing. “This is I think my first win over a top 10 player and I hope to be in the top 10 myself soon so to beat a player like Tarek is a great achievement for me,” added the 22-year-old from Cairo. Gawad will now face a further fellow countryman in the quarter-finals: Fourth seed Karim Darwish, twice winner of the title, beat compatriot Omar Mosaad 11-9, 4-11, 11-6, 11-5. 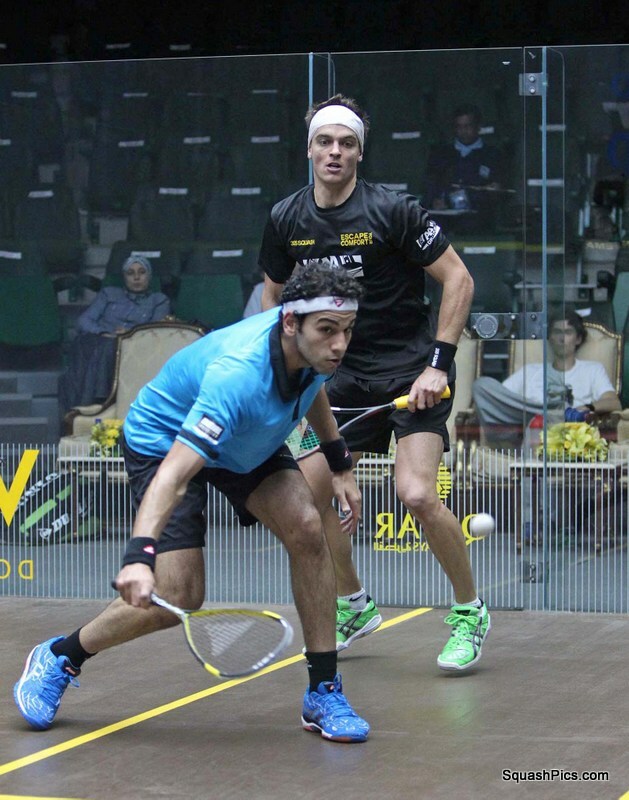 There will also be Egyptian interest in the other half of the draw where sixth seed Amr Shabana takes on England’s No 3 seed Nick Matthew in a mouth-watering quarter-final between two former world number ones. 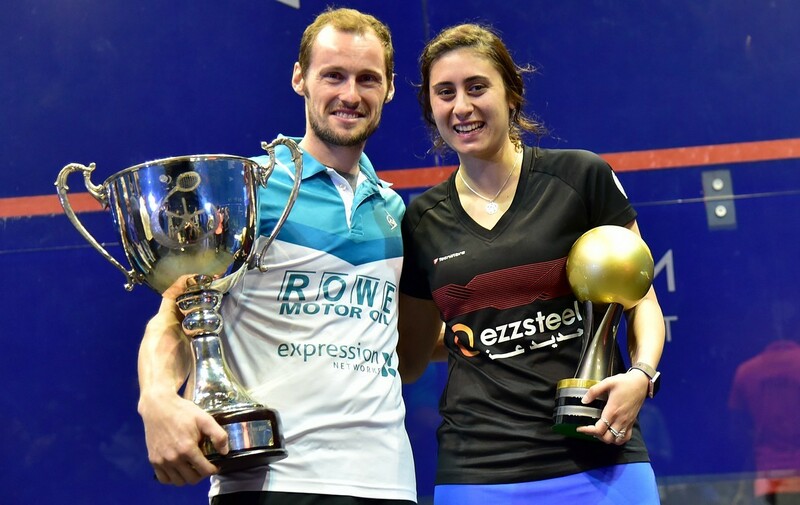 Shabana, the 2007 champion from Cairo, took just 28 minutes to subdue South African Stephen Coppinger 11-3, 11-4, 11-5 – while 2009 champion Matthew, winner of a third World Championship crown last week, defeated Colombian Miguel Angel Rodriguez 11-6, 11-7, 13-11 in 54 minutes. 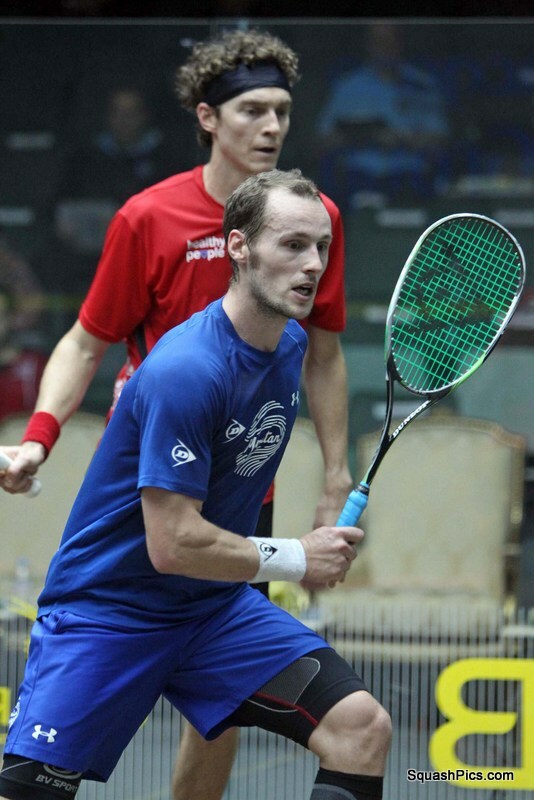 Event favourite Gregory Gaultier also progressed after a straight games win – beating top Australian Cameron Pilley11-9, 11-6, 11-4. The world No 2 from France will now do battle with top-ranked Spaniard Borja Golan, the seventh seed who beat England’sTom Richards 11-6, 11-7, 12-10.